Johannesburg (also called the City of Gold or eGoli) is a city with about six million inhabitants, situated in the province of Gauteng. The city has a western appearance with modern skyscrapers and big shopping centres. Johannesburg has a very pleasant climate; the summers are hot with most of the rainfall occurring in the summer months between October and April. Winter days are mild and dry, becoming cold (± 5˚c) in the evenings. A guided tour through Soweto should not be missed. The township is found to the southwest of the city. If you would like to visit a museum, you can get a free “Museum Map, Gauteng” which gives an overview of the 40 museums from one of the tourist offices. The most popular museums are: The Apartheid Museum (an absolute must see! ), Museum Africa (evolution of Johannesburg), the SA Breweries Museum (African beer brewing), the SA Museum of Military History and many more. There are a number of great shopping centres located to the north-west of the city such as Sandton and Fourways Mall for those wanting to buy South African merchandise. Gold Reef City lies to the south of the city and absolutely deserves a visit. It tells the story of the gold pioneers, their settlement and the gold mines which made the pioneers all their money. Genesis Suites: Set in the heart of Johannesburg, Genesis is ideally located with easy access to OR Tambo International Airport and the cosmopolitan leisure suburb of Sandton. Offering one and two bedroom En-suite suites. Flexible for different types of travellers, the suites are sold Self Catering or Bed & Breakfast, making this your ultimate home away from home experience. Genesis Suites Hotel offers comfortable luxury for all types of travellers, and to make your stay even more luxurious, you can look forward to many added values. The Sabi Sand Reserve was formed in 1950 and comprises many private game farms covering an area of 56,000 ha. Sabi Sand offers a spectacular African safari experience with superb volume of game and quality of sightings. The Sand and the Sabi Rivers supply much-needed water to the region, creating an incredibly bio-diverse wildlife population. The reserve is also situated on a dolerite dyke, which ensures that the soils are high in nutrition, producing one of the best grazing and browsing habitats in southern Africa. Sabi Sand was at the forefront of the development of the open-vehicle safari where qualified guides provide a safari experience that is both personal and highly informative, affording close contact with the fauna and flora of the region. There are over 30 different lodges located in Sabi Sand, many of which are situated in the southern Kruger region. Umkumbe Safari Lodge: It is located in the Sabi Sand Wildtuin and considered by many to be the premier wildlife reserve in South Africa. Located on the banks of the seasonal Sand River, Umkumbe Safari Lodge is perfectly situated in one of the best Big Five game viewing destinations in Africa. The reserve is home to the ‘Big Five’ (elephant, rhino, lion, leopard and buffalo), as well as cheetah, wild dog and hundreds of other species of animals, birds and plants indigenous to the area. 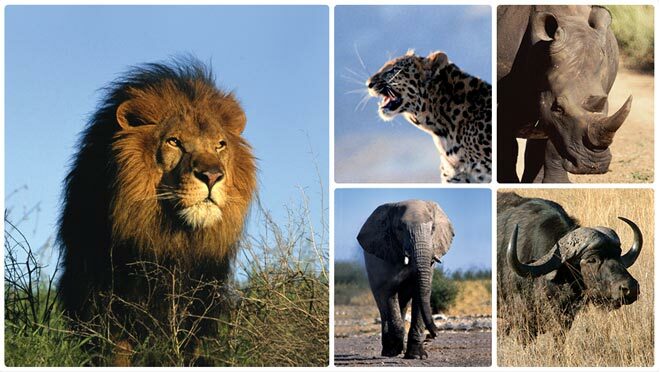 The phrase “Big Five” was coined by hunters of yesteryear – before the advent of the photographic safari – and refers to the animals considered the most dangerous to hunt. Umkumbe Safari Lodge offers guests exciting photographic safaris, and there is no better destination to photograph lions and leopards than the Sabi Sand Private Game Reserve. Strand Towers Hotel: The Strand Tower Hotel opened its doors on 1 May 2010. It is located on the corner of Strand Street and Loop Street in the centre of Cape Town. The Cape Town International Convention Centre is just down the road. The V & A Waterfront and the newly build Cape Town Stadium are within walking distance. The area boasts a wide variety of shops, restaurants and great coffee shops. The Gold of Africa Museum is just up the road. Restaurants such as Savoy Cabbage, Caveau and The Africa Café are less than 5 minutes walking away. Easy access to the Freeways (N1 & N2) Airport shuttles can be organized via the hotels Hospitality Desk.